News just in that Tomaso Polli in the London office of Edmiston & Company has signed the central agency for sale of Benetti's 44.22m superyacht Reangel. 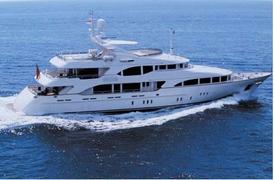 Built to Lloyds class in 2002, she sleeps 10 guests in a master, two doubles and two twins and cruises at 13 knots. Currently lying in Genoa, Reangel is asking €12.95 million.